Limit to first time Pilates Fitness client only. You can bring along one loved one to the same class(es) for FREE. 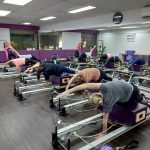 Your first class must be a “Reformer Introduction Class + Weight Loss Pilates” or “Reformer Introduction Class + Core & Body Aches Pilates Class” at any Pilates Fitness studios. Reservation via call / SMS / whatsapp at +65 9184 7622 is required before your first class. We are unable to process online booking or walk ins. Must present NRIC / passport and your Volkswagen car key during your first class. Once redeemed, 3 FREE classes are valid for 1 month from first class. A pair of clean socks is compulsory for each class. Shoes are not required. Valid for redemption during your birthday month and the month after.